And the artist hopes to inspire recycling! Artist Benjamin Von Wong decided to recycle e-waste in a new way—with his art. After learning about Dell’s recycling program, he partnered with the company to turn 4,100 pounds of e-waste into massive sets he could photograph. His sets, crafted of recycled e-waste like keyboards, laptops, and cables, took 10 days and 50 volunteers to take shape. 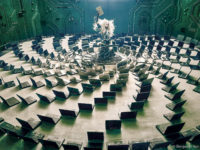 During his conversations with Dell, Von Wong wondered, “How do you convince people that recycling e-waste can be cool?” He found the answer by turning electronic waste into stunning photographs that capture not only the amount of e-waste but also the power of recycling. With all of the phones, laptops, smart watches, fitness trackers, headphones, and more that we buy and use every year, it’s no wonder the average American household throws out 176 pounds of e-waste each year. According to National Geographic, there were 44.7 million metric tons of e-waste in 2016 worldwide. That’s every TV, cell phone, computer, tablet, and other electronic device that either broke or was replaced in global households. While e-waste, or electronic waste, can be recycled, it usually isn’t collected at the curb and has to be delivered to a specific location. That means consumers may need to store e-waste until they can visit a collection facility in order to avoid throwing it in the trash where the toxic materials can hurt solid waste workers and the environment. Global e-waste is growing, and it could be as large as 52.2 million metric tons in 2021, according to National Geographic. Art like Von Wong’s encourages us to consider keeping our laptops a little longer, passing on old TVs to friends, and recycling anything that we can no longer use instead of trashing it. “The images will hopefully live on forever and empower every individual to tell their friends and family to rethink electronic waste [and] recycle it responsibly,” said Von Wong. See more images from the project and learn more about it here. Then, contact your local solid waste management district to find out how to properly handle e-waste in your community. Watermarked featured photo courtesy of Benjamin Von Wong. Note: Due to licensing requirements for the featured photo, the photo which appears on our facebook post linking to this blog is credited to GeorgeK | iStock | Getty Images Plus. Eco Partners helps you deliver local environmental educational information – cost-effectively and efficiently. We do all the heavy lifting and you get all the credit.